Lubricating Ability - Within an aircraft hydraulic system, moving parts generate fluid pressure and convert this pressure into useful work. The hydraulic fluid must prevent wear of these moving parts by allowing them to move in relation to each other with a minimum of friction and power loss. Investigations of hydraulic fluid lubricating ability have been conducted using bench test devices, which measure friction and wear, and using hydraulic test rigs in which the hydraulic pump functions as a wear-test device. Although bench wear machines and the test pump rigs test lubricating ability of the fluid, final evaluation for total performance must come from operational experience in actual aircraft hydraulic systems. 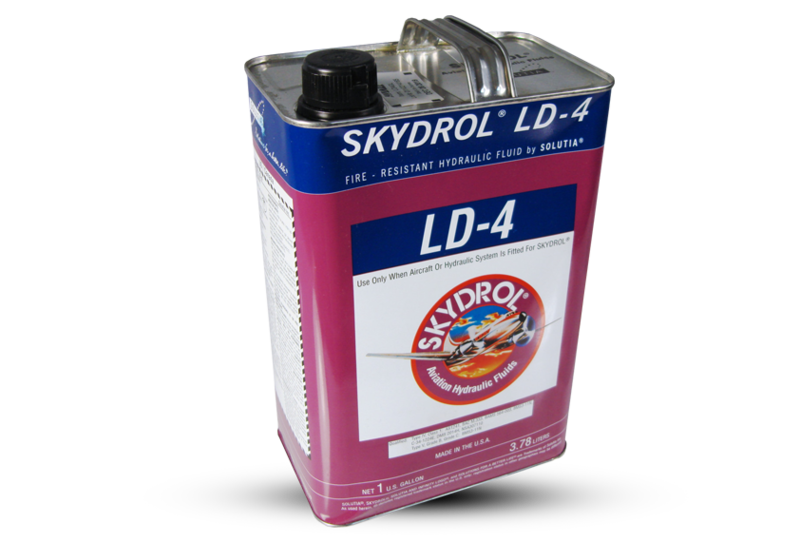 Skydrol Type IV hydraulic fluids have demonstrated excellent lubricating ability in millions of flight hours in a wide range of aircraft types. This experience has verified results from bench pump tests which show Skydrol Type IV fluids to be excellent lubricants. One commonly used bench test is the Four Ball Wear Test. Typical results with the Skydrol hydraulic fluids are given in the table below. Test conditions were 600 rpm, 167 °F (75 °C) and one hour at various loads. Pump testing is considered to be the best simulative method for evaluating the lubricating and stability characteristics of the fluid. Solutia’s pump test rigs are similar to and duplicate the test method described in SAE Specification AS1241. The airframe manufacturers use similar test methods. (See page 3 for specification listings.) Solutia’s pump testing facility uses either an Abex AP10V-58A or a Vickers PV3-160-4 pump in the test circuit. The test results obtained with Skydrol LD-4 and Skydrol 500B-4 are shown in Table A on page 14. During the tests there were no system operational problems. Post-test inspection of the pumps revealed that the clearances were within overhaul specifications indicating normal wear, and no deposits were found on the pump parts. The analyses of the fluid samples showed the expected decrease in viscosity with time due to the normal shear of the viscosity index improvers. Acid number increases were negligible. Since performance in the specified 500 hour test was excellent, the fluids were overstressed beyond the BMS3-11 requirement by running pump tests on the fluid from the first pump test, for an additional 521 hours. The test results are summarized in Table A on page 14. Performance of equipment and the quality of fluid were excellent. Asignificant aspect of fluid performance is the effect of air on the fluid at moderately high temperatures. Since aircraft hydraulic systems differ in reservoir design resulting in varying exposures of the fluid to air, Solutia conducted a number of “air sweep pump tests” which were designed to determine the deposit forming characteristics and stability of fluids. The first results of this work were reported to the SAE A6 Commercial Jet Panel in April 1976. The pump test circuit was modified so that a slow stream of air could be introduced into the reservoir during the test. 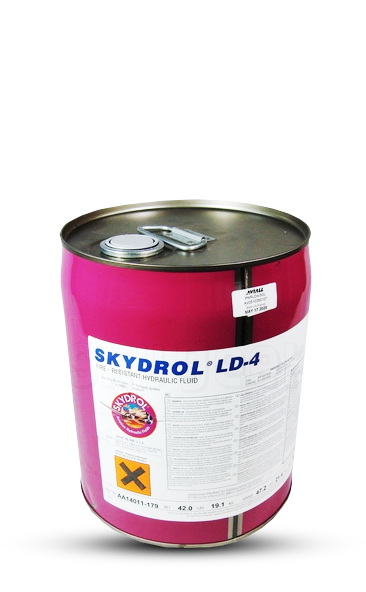 Table B on page 15 summarizes test conditions and results for Skydrol 500B-4 and Skydrol LD-4. Deposit formation is measured by increases in pressure drop across the filters during the test and post-test examination of the filters, the pump and the test circuit. The Skydrol Type IV hydraulic fluids showed no deposits by any of these criteria. It should be noted that actual field experience with deposit problems using various hydraulic fluids correlates well with air sweep pump test results. Longer-term air sweep pump tests (up to 1300 hours) have also shown no deposit-forming tendencies with either Skydrol LD-4 or Skydrol 500B-4. Test section temperature 250 °F/121 °C, 275 °F/135 °C last 5 hrs.